Save the date for the NextGen D.C. Spring Happy Hour! Learn more about UNICEF Next Generation, and UNICEF's lifesaving work around the world. Mingle with like-minded professionals as we build the community of NextGeners from across the D.C. area. All proceeds will go toward UNICEF Next Generation's current project: Ending Violence Against Children in Madagascar. 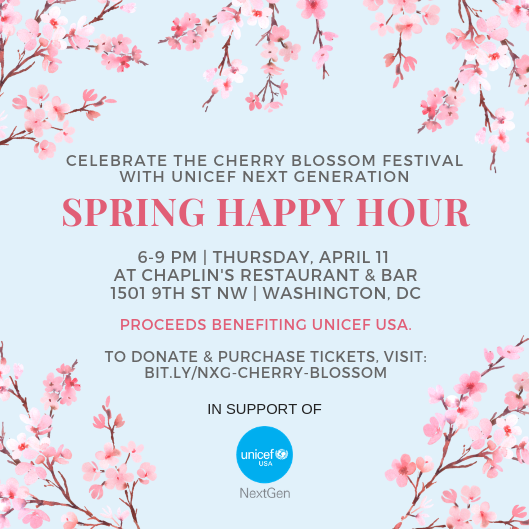 Chaplin's will be offering extended happy hour drink specials including cherry blossom-themed cocktails to all guests - first to RSVP receive a discounted early-bird rate. Raffle includes gift cards to local Cherry Picks restaurants. Open to non-NextGen members – Invite a friend or colleague who is passionate about putting #ChildrenFirst!